Island Lake in glorious sunshine. 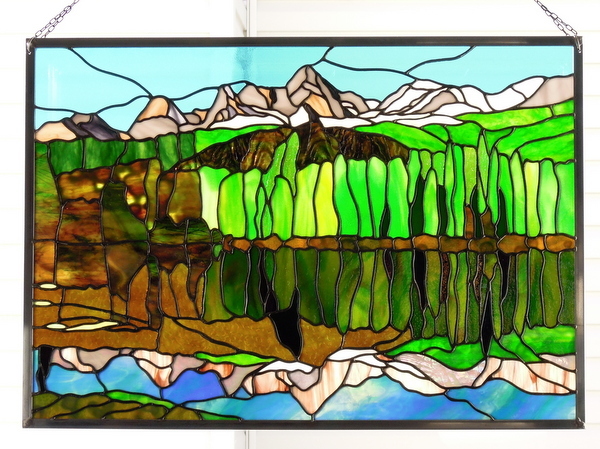 We used a lot of very interesting wonderful art glass from Spectrum, Bullseye, Uroboros, Wissmach and Kokomo to complete this panel which measures with the 1/2 zinc frame 26.5 inches wide by 18. 5/8 inches high. If you scroll down to the bottom of this posting you will see the photograph from which Martha at Paned Expressions Studios in Edgewood Maryland used to create this awesome reflective design scene. Island Lake is located near Fernie BC and it is here that our daughter Tanya and Sean were married a few years ago. All of the pieces for Island Lake have now been cut and rough ground. Next step is to fit and foil then the panel will be ready for soldering. 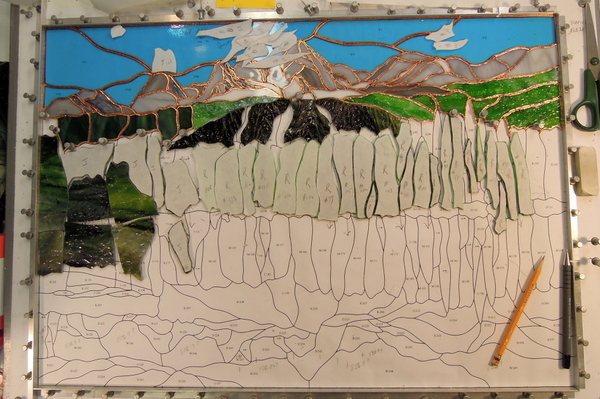 We have now finished about 2/3 of the Island Lake panel which when finished will consist of 257 pieces of stained glass. 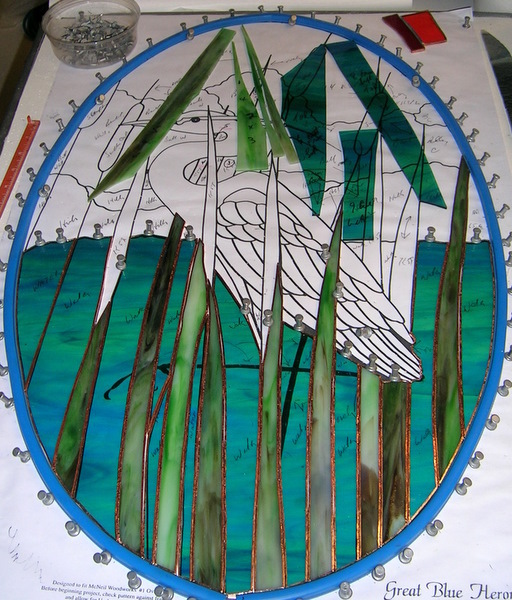 The next process will be to insert tracing paper and draw out the remaining pattern pieces on the tracing paper. Then we cut them out and glue them to the glass we want to use along with ensuring that the we obtain the glass direction we desire for each piece as well when deemed desirable we will sometimes reverse a particular pattern piece and glue it on the reverse side of textured glass in order to enhance the panel. 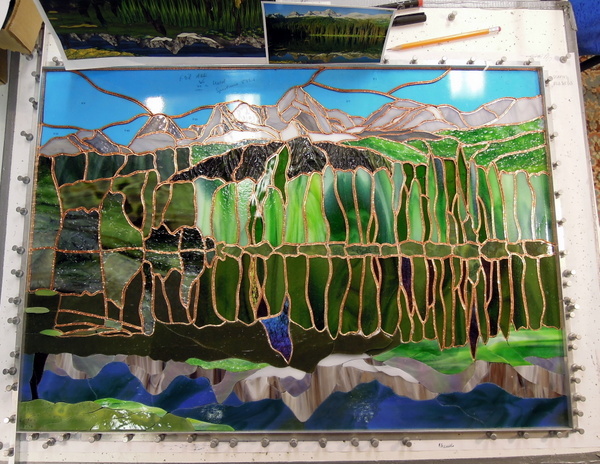 We have now traced another 50+ pieces and glued them to the respective glass pieces which have been cut. 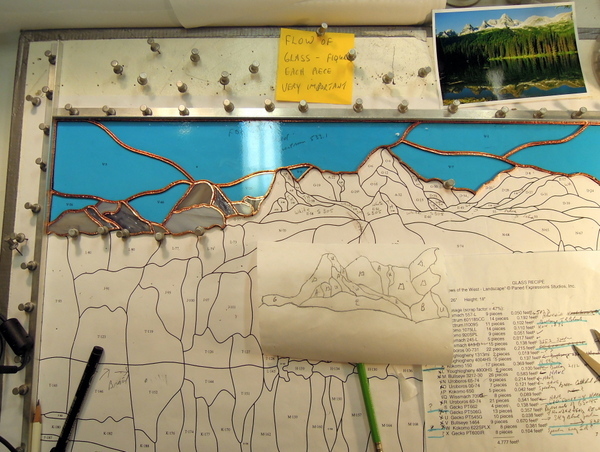 We now rough grind to the paper, remove the paper, fit each piece one at a time, foiling each piece as we go. 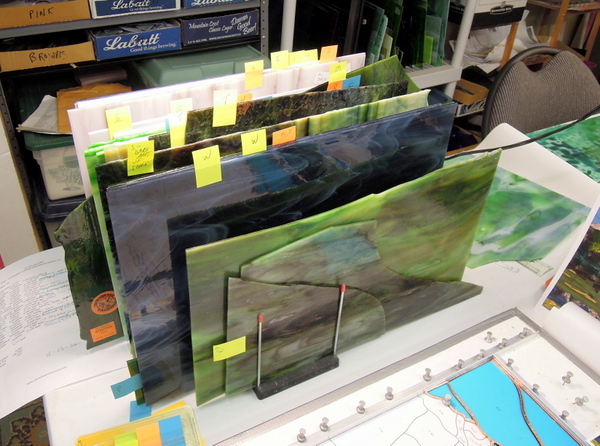 Some of the pieces have the paper on the reverse side of some of the glass as we want to use the rougher side for effect. 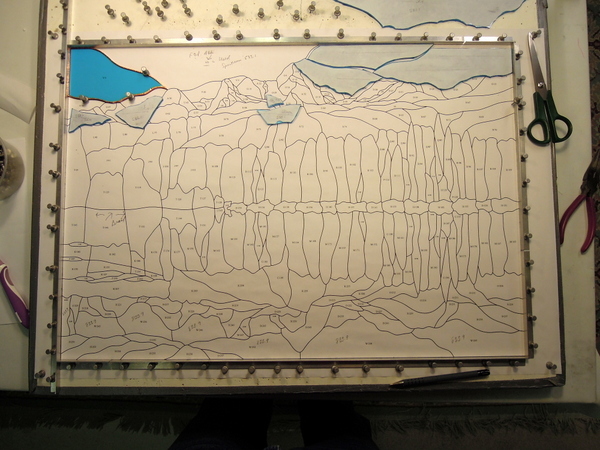 It has been a very busy Christmas season and we are now ready to paper and start the next reflective portion of the Island Lake panel. 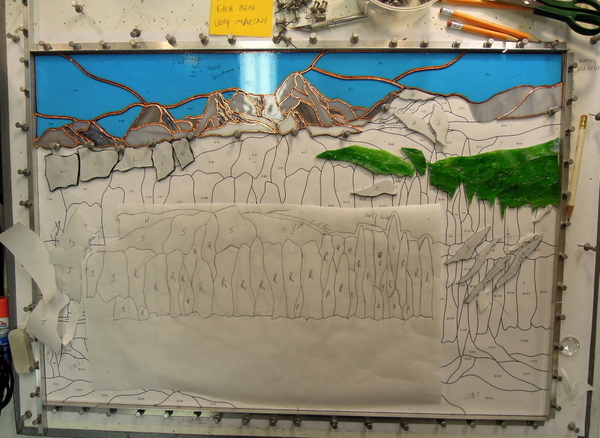 We are in the process of tracing out each piece on white freezer paper, selecting the glass and gluing each individual cut out piece to its appropriate glass piece. More updates to follow as we continue it’s construction. We now have a lot of new pieces cut out and ready to be ground, fitted in place and as each is completed that piece is foiled and burnished. 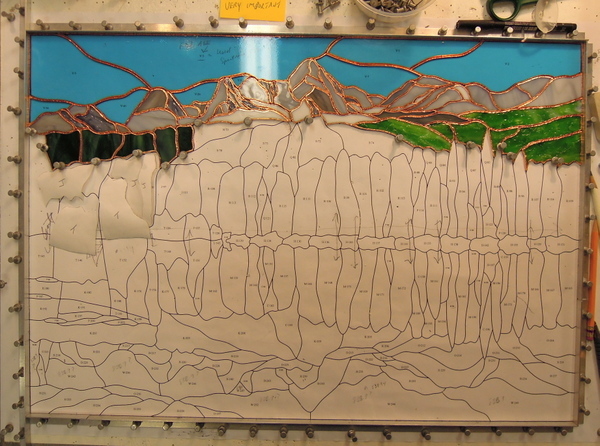 The mountains are now completed with a number of different glasses used. Next we will finish down to the water line. We continue to work on the Island Lake panel and here is an updated photo as at May 29, 2013. 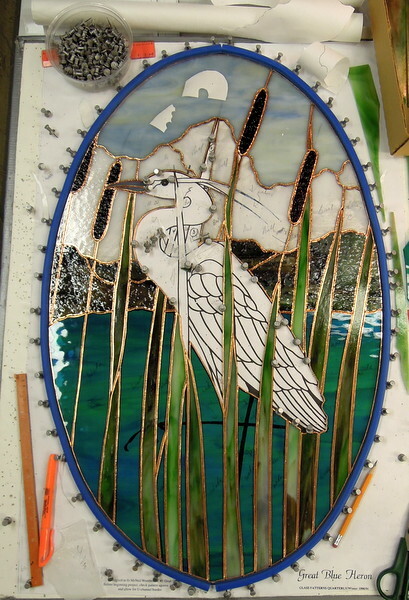 We continue to trace and apply to the various pieces of glass and have now sorted out all of the glass and color combinations we intend on using in this panel. We place white freezer paper over the pattern, then trace out each piece. 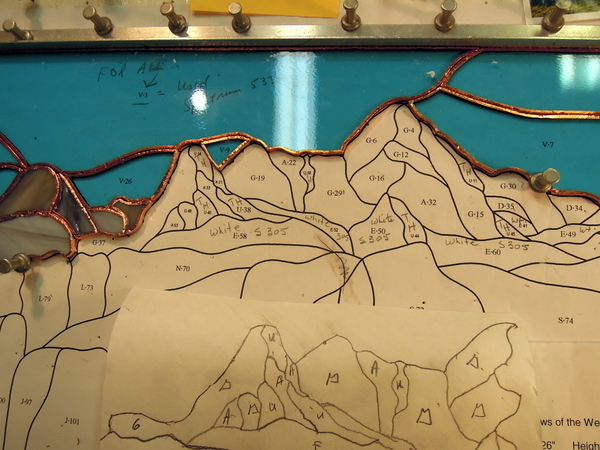 Once done we cut out and glue to the glass on the angles and directions that we want the glass to flow in the design. 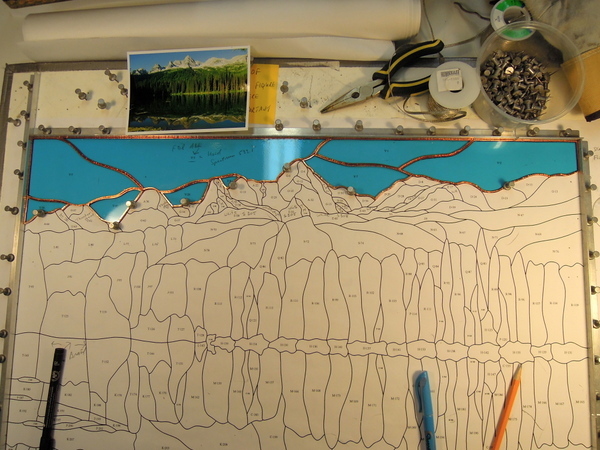 The mountains are beginning to take shape. We are using a combination of Spectrum and Wissmach glass with Spectrum’s Thunderhead being reversed for effect. For the blue sky we used Spectrum’s #533.1 and with the sky now completed we will start on the mountains. 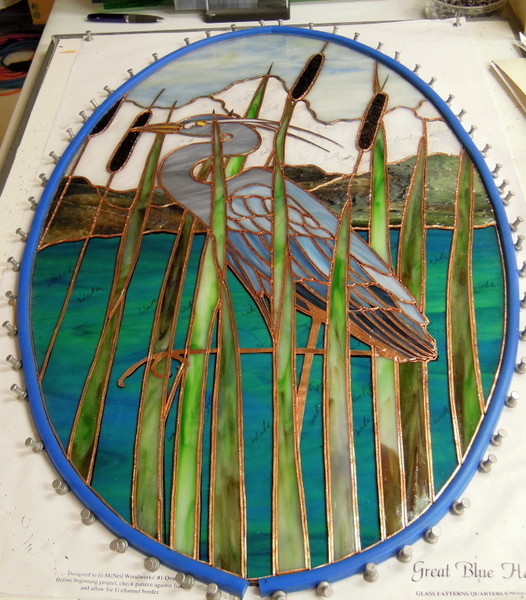 We now have most of the glass necessary to complete this panel, which is shown below we use the Morton Glass Caddy which works great for holding the glass for our projects. In view of the complexity of the picture we once again enlisted Paned Expression Studios to come up with the design for this panel from the picture. We have now started to construct the panel and will continue to post pictures and updates as it proceeds. To whet your appetite and let your artistic minds wander and contemplate? 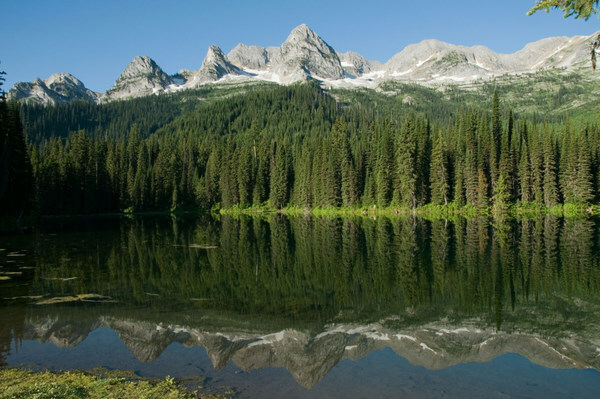 What will be done to turn this beautiful Island Lake photo near Fernie British Columbia into a stained glass panel? 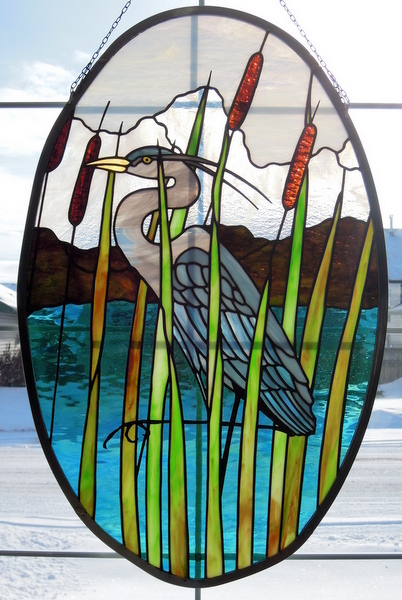 The Blue Heron Panel measures 28 in by 18 in, this photo taken in full sun. 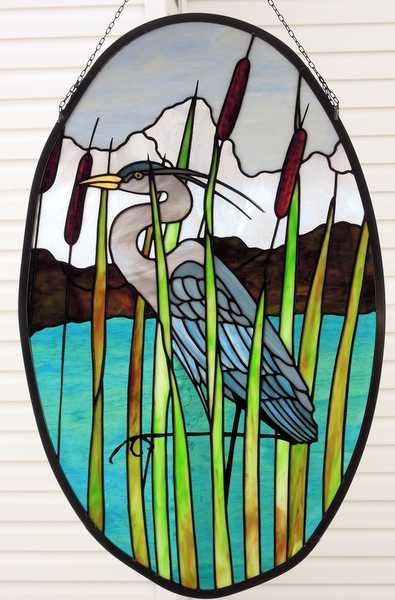 What always fascinates us about stained glass is how it changes with the light from sunny, cloudy, rainy, snowy days along with time of the year and the ever changing seasons. 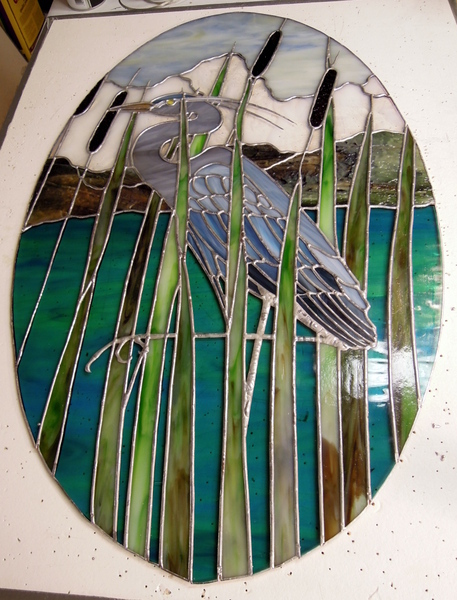 The Blue Heron Panel is now finished and is in it’s final cleaning and polishing stages. We will post a picture of the panel in full sunlight in the next few days. For the water we used Spectrum’s Pale Green/Aqua Blue Waterglass and matched it across the panel along with the sky using Kokomo’s 14SPL. For the bull rushes we used Spectrum’s Brown on Gold Streaky Granite and for the leaves a Brown/Green Kokomo 59L. We now have cleaned the panel’s solder lines with steel wool and applied black patina. Next step will be to make the frame. The first photo is of the front of the panel, while the second photo is of the reverse side. 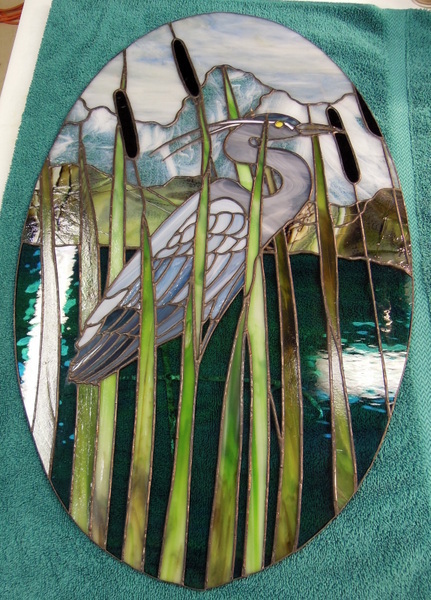 Here is the Blue Heron Panel with the front side soldered and all the flux has been removed using Kwik Clean. Next step will be to finish the reverse and then we will clean the solder with #0000 Steel Wool and then patina all of the solder lines black. 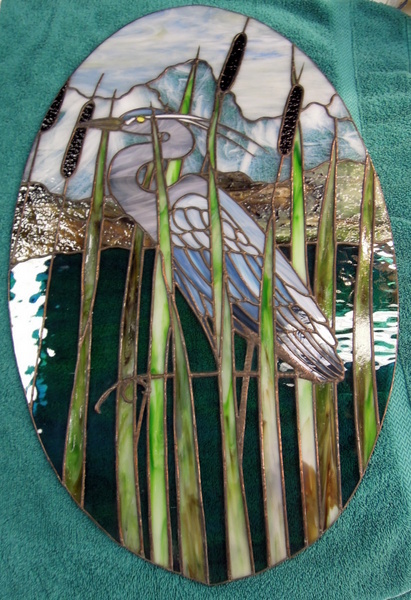 We now have finished burnishing on the copper foil overlay on this blue heron panel. 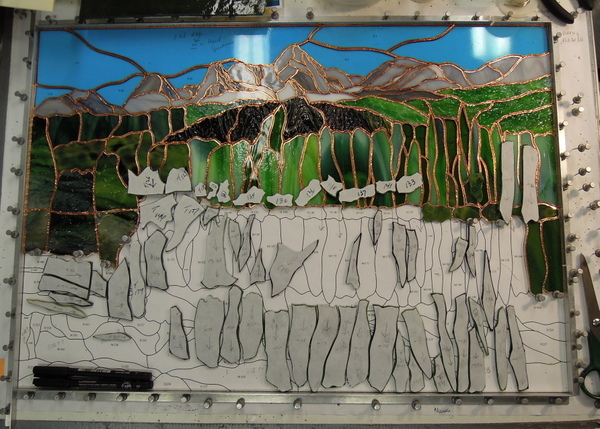 The next process will be the soldering of the panel which will be somewhat difficult due to the narrow pieces of glass and the copper foil overlays as too much heat could crack the glass. 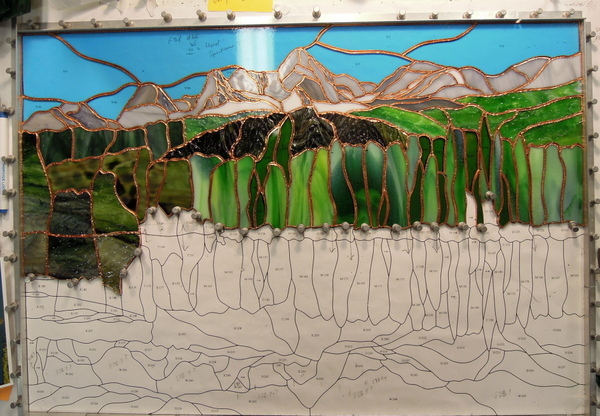 We just finished putting in all of the pieces of glass today(October 25, 2012), now we have to put on the copper foil overlay (re legs etc.) 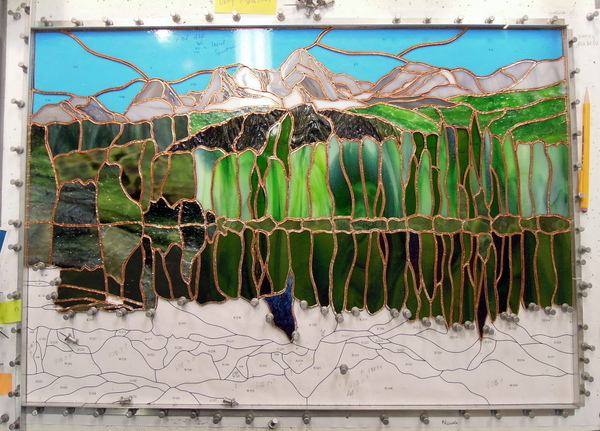 and once that is finished will post another picture with that burnished on, then the panel will be ready for soldering. 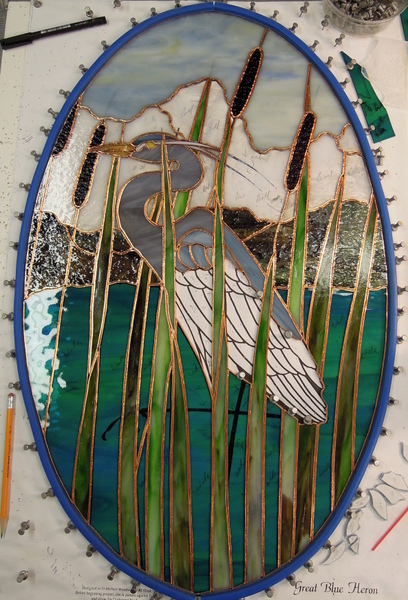 This is the latest construction photo of the Great Blue Heron Panel as at Oct 11, 2012. 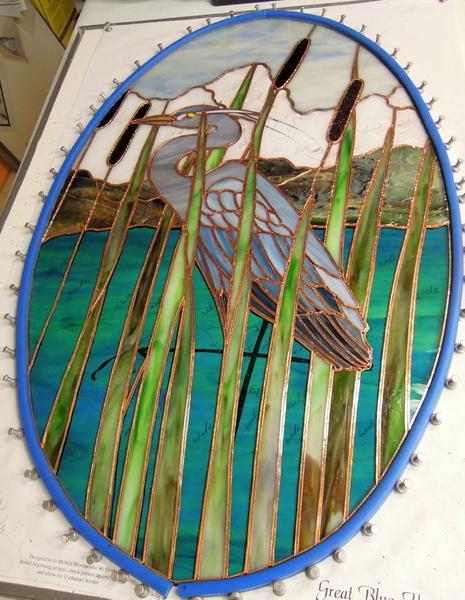 This is an ongoing construction photo gallery of this Great Blue Heron Oval Panel which we are making for a home in Toronto. The oval panel measures 18 inches wide by 28 inches high. 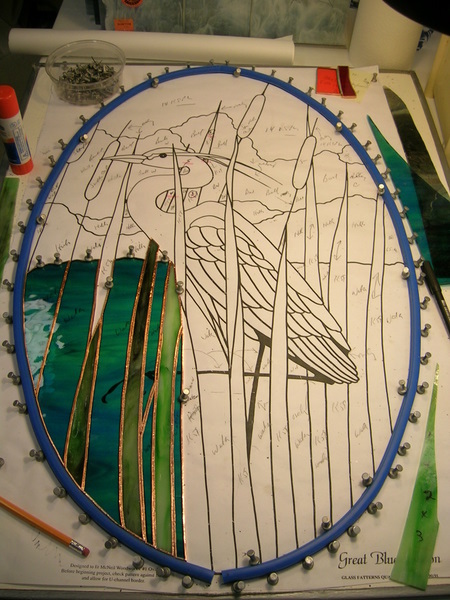 We have had a very busy year with many extenuating circumstances which prevented us from spending time in our studio, all that now remains to be done is the Heron and the foil overlays. Then of course soldering, cleaning, black patina cleaning, polishing and framing. We used Spectrum’s 423-1W Pale Green/Aqua Blue Waterglass for the water and it is matched all across the design. For the bull rushes we are using a Kokomo # 59L.